Vol. 1, no. 1 (June 7, 1856)-v. 27, no. 21 (Nov. 9, 1882). 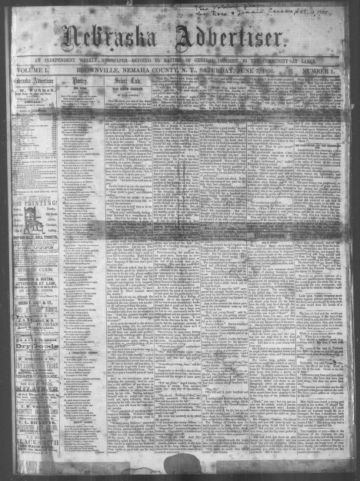 Brownville telegraph issued to Advertiser subscribers, Dec. 5, 1860-Mar. 14, 1861. Merged with: Nemaha County journal, to form: Nemaha County journal and Nebraska advertiser. Other ed. : Nebraska advertiser (Brownville, Neb. : Daily), Sept. 5-Dec. 24, 1870. Published at Calvert, Mar.-June, 1882; Auburn, June 8-Nov. 9, 1882.